Greek lawmakers voted overwhelmingly early Thursday to approve a harsh austerity bill demanded by bailout creditors, despite significant dissent from members of Prime Minister Alexis Tsipras' left-wing party. The bill, which imposes sweeping tax hikes and spending cuts, fuelled anger in the governing Syriza party and led to a revolt against Tsipras, who has insisted the deal forged after a marathon weekend eurozone summit was the best he could do to prevent Greece from catastrophically crashing out of Europe's joint currency. Prominent Syriza party members were among the dissenters, including Energy Minister Panagiotis Lafazanis and former finance minister Yanis Varoufakis, who many blame for exacerbating tensions with Greece's creditors with his abrasive style during five months of tortured negotiations. The vote came after an anti-austerity demonstration by about 12,000 protesters outside parliament degenerated into violence as the debate was getting underway Wednesday night. 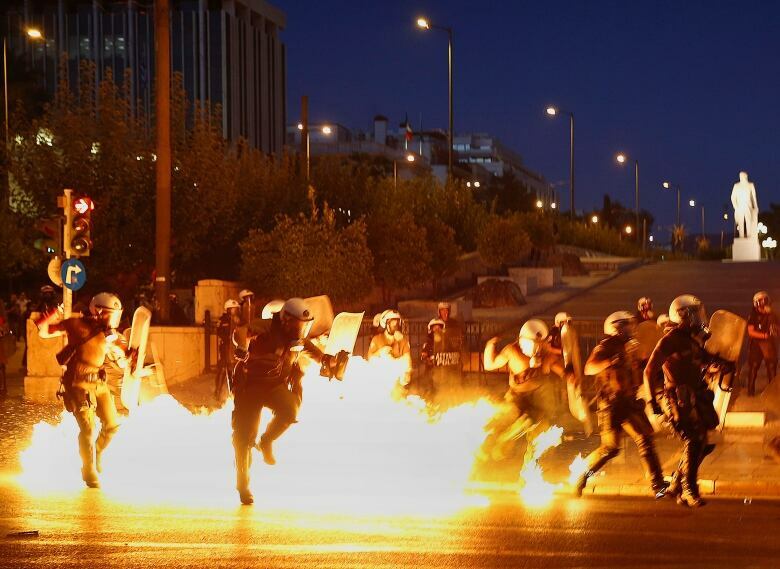 Riot police battled youths who hurled petrol bombs for about an hour before the clashes died down. The bill was the first step Greece must take in order to begin negotiations with creditors on a new bailout — its third in five years — of about 85 billion euros ($93 billion US) in loans over three years. Dissenters argued that Greeks could not face any further cuts after six years of recession that saw poverty and unemployment skyrocket and wiped out a quarter of the country's economy. Tsipras has been battling all week to persuade party hard-liners to back the deal. He has acknowledged the agreement reached with creditors was far from what he wanted and trampled on his pre-election promises of repealing austerity, but insisted the alternative would have been far worse for the country. 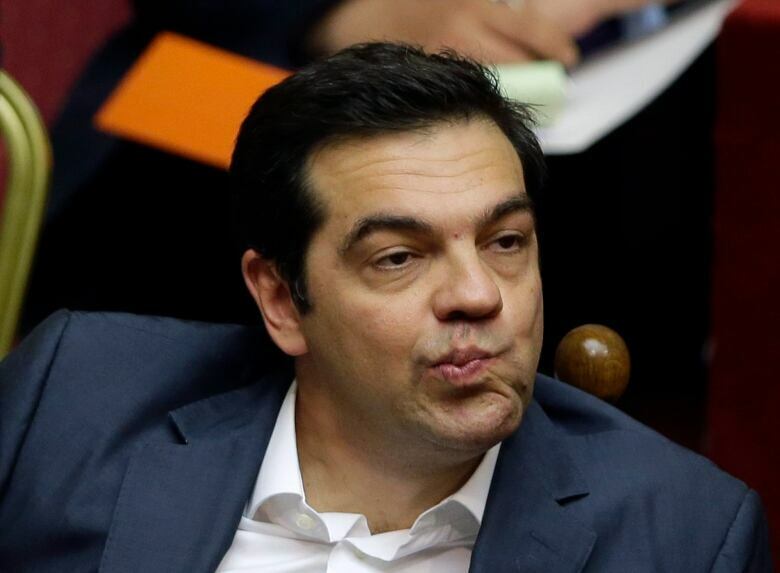 Tsipras had urged Syriza members to back the bill despite having urged voters to reject earlier, milder creditor demands in a July 5 referendum. Greeks voted overwhelmingly to reject those proposals. Finance Minister Euclid Tsakalotos, who took over from Varoufakis the day after the referendum, said the deal Greece reached with its creditors on Monday was the only possible choice. "I must tell you, that Monday morning at 9:30, it was the most difficult day of my life. It was a decision that will weigh on me for the rest of my life," Tsakalotos said. "I don't know if we did the right thing. But I know we did something with the sense that we had no choice. Nothing was certain and nothing is," he told parliament. High-ranking dissenters included Alternate Finance Minister Nadia Valavani, who resigned from her post earlier Wednesday, saying she could not vote in favor of the bill. In a letter sent to Tsipras on Monday and released by the finance ministry Wednesday, Valavani said she believed "dominant circles in Germany" were intent on "the full humiliation of the government and the country." The economy ministry's secretary general, Manos Manousakis, also resigned over the measures. Parliament speaker Zoe Konstantopoulou, a prominent Syriza member, slammed the deal as a product of blackmail, calling it a "crime against humanity" and "social genocide." Thursday's vote came after more than two weeks of capital controls, with Greek banks and the stock exchange shut since June 29 and ATM cash withdrawals limited to 60 euros per day. With its banks dangerously low on liquidity and the state practically out of cash, Greece desperately needs funds. It faces a Monday deadline to repay 4.2 billion euros ($4.6 billion US) to the European Central Bank, and is also in arrears on 2 billion euros to the IMF. The European Commission has proposed giving Greece 7 billion euros in loans from a special fund overseen by all 28 EU nations so it can meet its upcoming debts. The loan would be made pending the start of a full bailout program, but faces resistance from Britain, a non-euro member of the EU. Germany argued one way for Greece to meet its financing obligations was for it to issue IOUs for domestic needs.